1. Ratio: 20:1, 30:1, 40:1, 50:1, 58:1, 60:1 (athers available). 2. 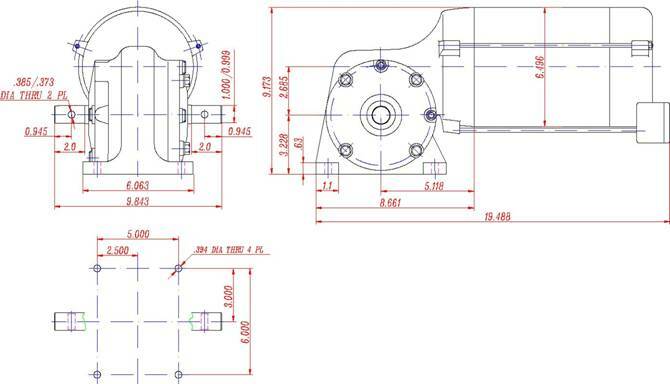 Use self-locking taper shaft connection (motor to worm-shaft) allows on-site replacement without removing worm-shaft, or disconnecting the load. This ensures precision alignment eliminates fretting to expedite motor removal. 3. Mount bolt patterns 5” × 6”. 4. 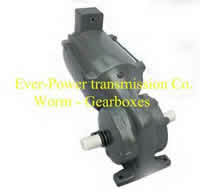 High strength aluminum bronze worm gear. 6. Includes special external crop guard seals. 7. Precision die cast tempered aluminum housing. 8. All critical electrical connections are encapsulated to resist penetration of moisture. 9. Specially designed for rugged irrigation duty. 10. 460/380 volt, 3 phase, 60/50 HZ dual voltage. 11. Thermally protected; automatic reset. 13. Totally enclosed light weight easy to access top junction box. 14. Class F rated insulation. 15. Minimal AMP draw: full load current at rated voltage, 2.3 AMPS. 16. Weight: 43.2 lbs (19.6Kg).